The preceding chapters present a systematic argument for those within the climate change community to explore opportunities for interventions that would increase knowledge, change attitudes for the better, and lead to the practice of climate change adaptation. However, exploring these opportunities should be guided by a framework. 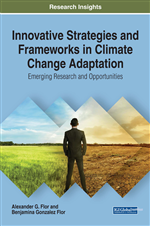 In this chapter, we propose one such framework, a knowledge management strategy for climate change adaptation. This knowledge management strategy does not only belong under the cognitive domain as argued in Chapter 3. In fact, it straddles all three domains since the affective and psychomotor domains are also influenced by knowledge. Its major assumption is that climate change response (knowledge, attitudes, and practice) can be increased and enhanced through knowledge sharing and reuse. KM is an evolving discipline that considers an organization’s intellectual capital as a manageable and potentially profitable asset (Leibmann, 1999). It is based upon the assumption that today’s global economy is knowledge-based and that knowledge is a primary commodity as well as a valuable resource that can generate or lead to other resources (Flor, 2001). KM entails digitally capturing documented and tacit knowledge and storing these for sharing and reuse. Thus, knowledge is managed through a complete intranet system (inclusive of Internet) and guided by organizational policies that provide incentives to knowledge sharing. The goal of knowledge management is the sharing and reuse of intellectual capital (Leibmann, 1999). Although, distinctions are made between undocumented or tacit knowledge and documented or explicit knowledge, both are captured digitally and stored in a knowledge base. These are also made available digitally in a variety of multimedia formats for sharing and reuse. Knowledge resources on climate change are currently building up from diverse sectors (the academe, research and development sector, the government sector, the international development assistance sector, etc.). These resources should now be leveraged and brought to bear at the soonest on this inescapable threat. However, are these resources adequately maximized or managed? Unfortunately, a substantive portion may be caught in the deluge of information products or lost (as T.S. Elliot puts it) in the multitude of platforms and sources that compete for our attention and utilization. Knowledge management is what academics refer to as a convergent discipline or a transdiscipline. Traditionally, it has been associated with library or information science, communication science, information technology and knowledge economics, not to mention the management sciences. Additionally, its complex character has been significantly influenced by its evolutionary trajectory. KM, both as discipline and practice, began in the private sector in the early nineties. Since then, it has been adopted by the international development assistance community and the government sector. Its evolution from a corporate area of study to a developmental discipline influenced by at times conflicting thrusts of its associated fields has resulted in diversified schools of thought within the KM purview. Not all these schools of thought and their attendant techniques are relevant or applicable to climate change. Nevertheless, knowledge is the most available resource to mitigate or adapt to climate change. As a society and as a country, we should know how we can mitigate or adapt to climate change. KM is essential because resilience is the result of knowing one’s options or alternatives.